If you’re looking to buy a window vacuum but a bit confused by all the choice you’ve come to the right place. 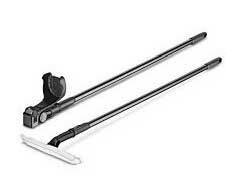 I’ve reviewed the best Window Vac’s available right here in the UK. Plus I’ve got a quick buyers guide with everything you need to know and a couple of tips for using it so you can get the best results once you’ve bought one! But first here’s a quick summary of the models that got reviewed. I personally think so, the amount of hassle they save when actually cleaning your windows is great and there are a bunch of other uses for them as well. Espares have a great article on different things you can use your window vacuum for. After you get out the shower just run the window vacuum over the glass and it’ll remain watermark free! You get a really nice sleek finish on a car if after you wash it you go over it with a window vacuum. Not just the windows but the whole car. A really nice streak free finish. Just run the vacuum over them and they’re cleaned up! No need to get out a mop and spread it around the floor. I feel I should point out that it only works on hard floor… Not much use on carpet! If you get a lot of condensation on the inside of your windows it can be a real pain because you stop being able to see outside! 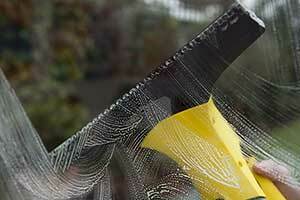 But get a window vac for condensation and your windows will be clear and free. 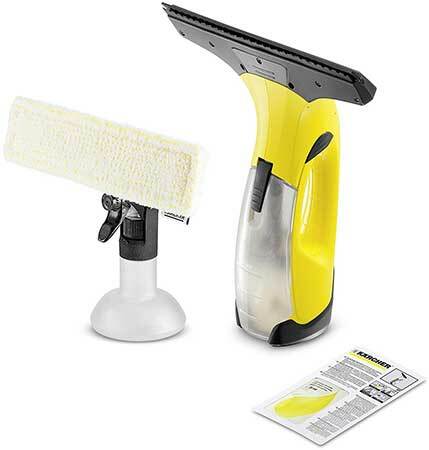 This is the classic use and the most useful, you can clean your windows with a sponge or however else you want and then run over them with the vacuum and they’ll be sparkling clean and free from streaks! Nobody wants to start cleaning only have to stop 10 minutes later and wait for their vacuum to charge. So an ideal run time is about 20-30 minutes. That’s normally long enough to clean about 25 windows so long enough for anything you need to do. You don’t necessarily need any accessories but depending on the job at hand they can make life a lot easier. The only ones you might need are an extension pole, handy if you have tall windows, and a spray bottle and cloth. Not essential but a spray bottle and cloth make the whole cleaning process that little slicker. If you have small windows you might need a smaller blade attachment, if so then you definitely want to go with a Karcher, they’ve got a handy small head that clips on nice and easy. 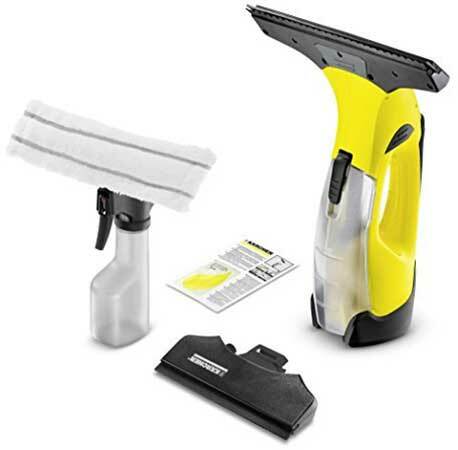 Brand isn’t absolutely necessary as there are some really good off-brand window vacuums but if you get a Karcher for instance you know you’re getting some serious cleaning power. Some people don’t get the results they hope for from a window vac so I just want to go through a couple of the more common mistakes people make. It needs to be pulled down across the glass with a slow steady movement, if you go too fast it misses a lot of the water. A lot of the time window vacuums empty from the top of the bottle, so when people tip them over to empty them they tip it too far and it runs up their hand. Just take it slow, it can only empty so fast, tipping it more definitely doesn’t make it faster and can just cause a right mess! They’re not designed to be used sideways like a traditional squeegee, you just need to go up and down, if you sideways it doesn’t vacuum properly and all the water will just fall down sideways! Just up and down. And here we are at the main event! 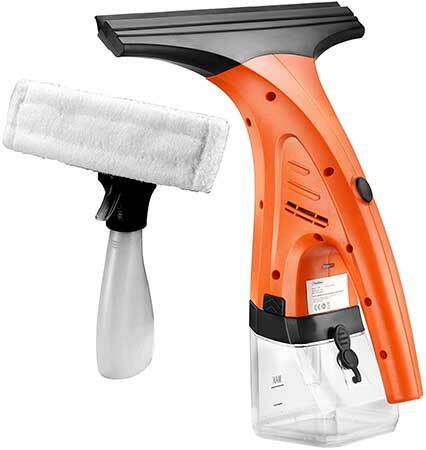 Time to take a look at some of the best window vacuums available right here in the UK. Just click the “Price & Reviews” button to get taken to Amazon so you can order yours today. The Karcher VW 2 Plus is everything you need in a window vacuum. It’s a superb price, comfortable to hold, not too loud and does a great job. It comes with a sample of the cleaning concentrate which I’d probably try out before committing to a big bottle, it works quite well just make sure you read the instructions! The battery life of 25 minutes is more than enough time for you to get around your windows. If you have condensation it’ll make short work of it and save you having to wash an extra towel every day! And it’s got mess free cleaning, you just pop open a little stopper and pour it straight into the sink, then it’s just a couple of hours charge from flat and it’s good to go again! Overall, a great choice of window vacuum, can’t go wrong. The VW5 is Karcher moving towards a more professional Window Vacuum. They’ve done the classic thing and made it lighter, shorter, quieter, with a longer battery life and you can get a spare battery for even longer use. It’s about double the price of the VW2. Overall, it’s up to you if you need the extra cleaning power, or you have a lot of windows you’re going to be cleaning then this’ll definitely be worth it for. If you just need a window vacuum for condensation then the VonHaus will be perfect, it’s cheaper than the Karcher but works pretty much aswell. Especially if all you need it for is cleaning condensation. The water tank holds 300 ml which is more than enough to get even big windows that are covered in condensation. It can also handle all the other jobs a window vac should be able to so you get multiple uses out of it as well. One thing that should be noted is that if you’re vacuuming down a conservatory roof there will be some splash down on top of you! It doesn’t handle being that horizontal very well and water tends to drip out the back. Overall, a great choice of window vacuum is you’re just dealing with condensation, for anything else as well I’d go with one of the Karchers above. 8 Best Pet Hair Vacuums UK 2018 Reviewed – Keep Dog And Cat Hair at Bay!